This Trini Bhaji rice is another wonderful “one pot” dish that is really delicious. This rice dish belongs to, what I would term, the mixed rice family. 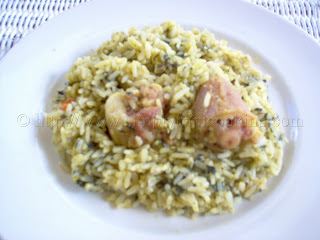 Earlier on I posted Split peas rice and an Ochro rice which you would notice has somewhat the same procedure when cooking, save for maybe a little variation with the use of different meats to flavour the pot. 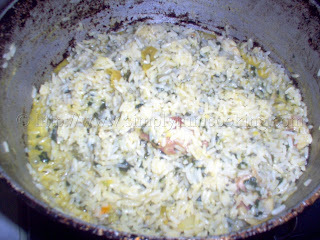 In the split peas rice we used saltfish and in the ochro rice we used smoked bone. 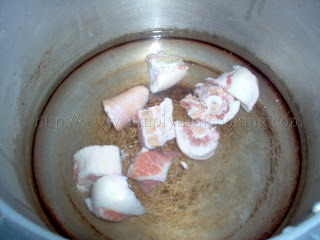 This time we used pigtail, a preserved meat imported from Canada, to show you how diverse this dish could be. The pigtails are preserved in brine that gives it a distinct flavour which is infused into any meal you prepare using this meat. 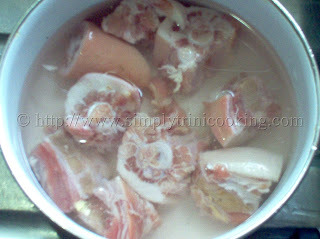 Instead of using the pig tail, for those who do not eat pork, another meat can be substituted or no meat used at all. It will still taste superb. 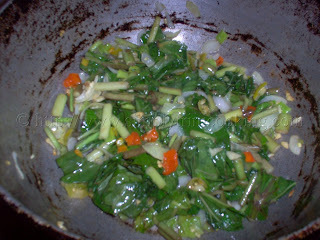 As the recipe title shows “Bhaji” you know that the main ingredient in this dish will be bhaji, which you already know could be either Spinach (amaranth) or dasheen leaves etc. 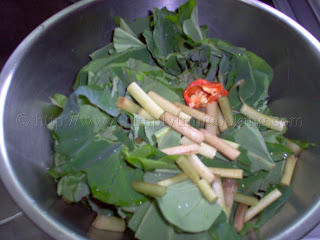 I decided to use dasheen leaves this time when the meal was being prepared. 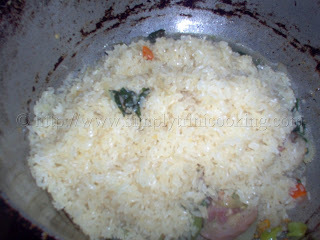 I really like how the leaves melt into one homogenous mixture and colours the rice. If you use the amaranth instead, the texture is a little different. The other key ingredient is the coconut milk. The coconut adds a taste to the recipe I just can’t put my hands on to describe and I would like to think that after all these years I would be able to describe it. 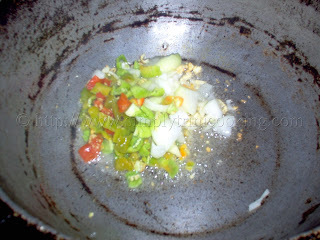 By itself ,the coconut has one taste but when together with other ingredients…..well it reminds me of when I looked at Ratatouille experimenting with two different tastes, with all the swirly colours and sounds oooh!! !… you get the picture ;^). Here’s bhaji rice. Do enjoy. Then add the pigtail and hot pepper. 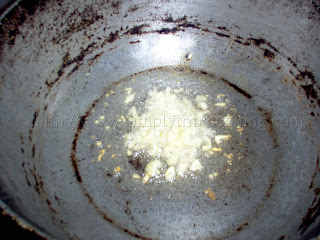 Mix the ingredients so that everything is evenly coated with oil. 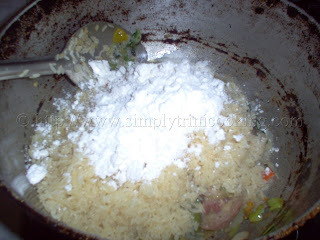 Add the rice, coconut milk powder and roucou. 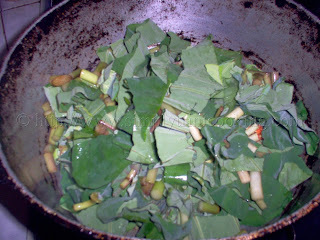 Add a little water and simmer over a medium fire for 20 to 30 minutes. Stir frequently to avoid the rice sticking. The meal looks ready now. Add salt to taste. Make sure most of the water has evaporated. That’s it for another post; see you soon. 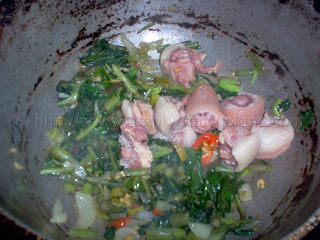 One of my favourite dishes to eat as a little girl, minus the meat of course. 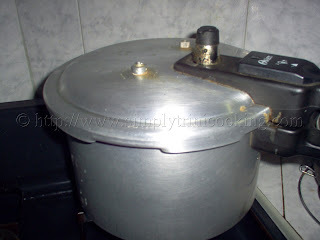 Back then my family were so poor we ate nothing else but i love it and will still eat it with pleasure if it were put in front of me. 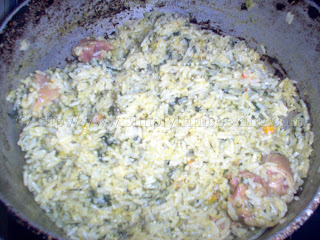 We don’t eat pork, so I would make it with saltfish, and that’s the best rice dish I can conjure up fast now. I know what you mean. Even without the meat it tastes good. I always loved this dish but never tried to make it until today… It came out greeeeaaaat!!! Thanks alot! I am Jamaican and live in Brooklyn, NY. What can I use instead of dasheen leaves here?? Can I use spinach or any greens?? I love trini food!! I tried this and oh it taste so good. 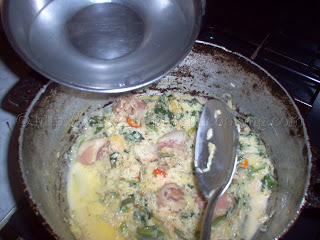 You can use saltfish or just leave it plain without meat. My son is allergic to coconut milk. Is there anything I can sub for it????? You can remove coconut milk from the recipe all together. 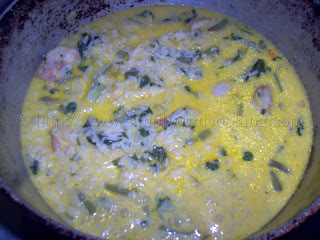 Use water instead, but the smooth creaminess in the meal would be difficult to develop without the coconut milk. Or, some people believe almond milk is a good substitute because of its nutty flavour. i love your recipes . Thank you for sharing them so generously ! Do I buy the coconut milk sweet or unsweetened? Thank you! Normally don’t buy coconut milk but unsweetened sounds closer to what we make. I always love bhaji rice but never know how to make it until now. Thank you for the recipe, it’ll surly try it. Roucou is liquid made with the fruit of the achiote tree. It is mostly homemade. You can read more about roucou here. 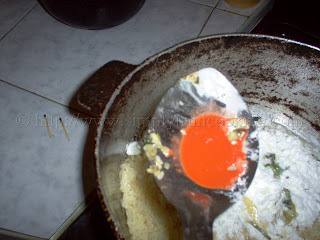 However, if you cannot find it, you can substitute it with tomato paste for colour.